Splits from Last's Week "Half Marathon"
Mile 7: 8.02 - Payback - going downhill. I like how I was pretty consistent which was my goal: to hit roughly 8:20-8:30 pace. Normally my pace goes something like this: 7:30's for miles 1-3. 8's for 4-5, 8:30's for Mile 6 - 9, then 9 - 10+ minute miles for the final 3 - 4 miles. While I was hurting at the end I wasn't crawling to the finish line. Looks like I am out for the Sand Hollow Marathon. I thought this was going to happen, but for those that know me, I ran into some unforeseen personal problems. It also didn't make a lot of sense for us to travel to Southern Utah, come back, and then 2 weeks later go back. Also the entire trip seemed rushed. 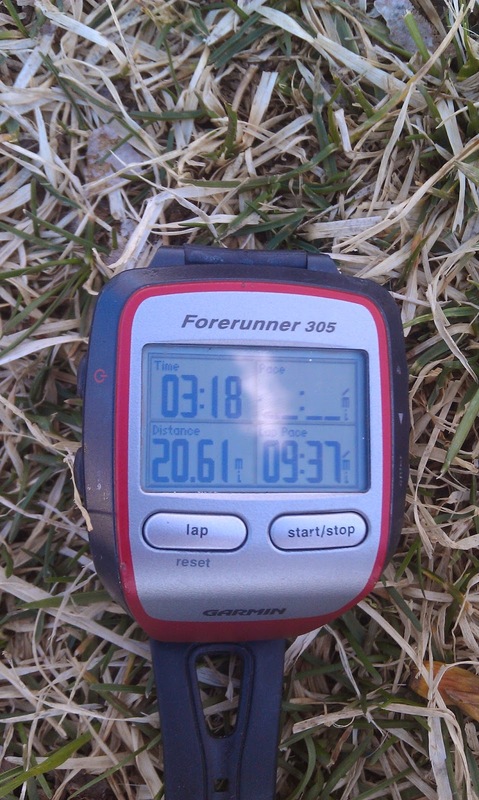 For instance, the day before we were going to walk around Zion -- not really smart the day before a 26.2 mile race. Right now, the plan is for me to do the Summerlin Nevada Half Marathon in mid April. In lieu of the Hurricane race I'll spend an extra day in Mesquite, NV and explore Valley of the Sun and Lake Mead. For all the times I've been to Nevada / Vegas, I've never checked those places out. Since I am largely marathon trained at this point, I'll jump into the Salt Lake City Marathon one week later (eek!). This is a bit more expensive as far as the race is concerned but it is local and it is going to be one of the larger races I've done... At least I won't need a hotel or have to drive major miles -- I can just take the train there. I think it is a fairly large and draws an international crowd. If things hold up and my finances come back a bit, I'll be looking at doing the Casper, Wyoming Marathon in June. It would be nice to knock Wyoming off my list as I've never run more than a few miles in Wyoming when I first moved here (I think I did about 4 miles in Rock Springs). There is also a local 5K race in South Jordan Monday night for St Patrick's Day. I may give that a go as well, being it is a Monday night and I've got nothing better to do. Training continues to go well. I am hitting between 40 - 50 miles during my "on" weeks. I did an easy week in preparation for that half marathon mostly because I was starting to get Achilles Tendinitis. I want to say that largely has resolved itself. Right now, on my way to the bike trail I have to run down a fairly substantial hill. It is less than a quarter mile from my house and at that point I am not really warmed up and I think that puts a strain on it. I've been taking it easier on that hill and hopefully it doesn't rear its ugly head again. Since moving to Utah I've managed to dodge the Ugly Injury Monster other than some minor aches and I want to keep "him" at bay. A lot of the "upcoming races" is dependent upon a 20 mile run I plan on doing tomorrow. If that goes reasonably well and I come back in one piece -- then I am signing up for the marathon. If not, I'll have to determine what went wrong and what the best course of action will be. My long run went reasonably well today. There was some 15-20 mile per hour winds that slowed me out heading out, but I managed to get a bit of a tailwind coming back. I went about 10.5 miles out and came back 10 miles, so a total of 20.61 miles. I was slower than usual on account of the wind. I still had lots of energy at miles 17 and 18 though. I managed to latch onto another runner that kept my pace honest. After we parted ways, however, I felt the weight of dead legs upon me again. None the less a promising run.